I wanted to share what will be my last vignette on the coffee table/trunk that's here in the Living Room. We've been here at the lease house since the middle of January, and if all goes to plan, we'll start moving some things over to the new house this weekend. We're waiting on carpet for the upstairs bedrooms that has been delayed. That's thrown us back about 3 weeks, but at the same time gave me more time to finish up the kitchen cabinets. Last weekend I touched up woodwork throughout the house, while Aly (our younger daughter and right hand helper) was on floor cleaning duty. So, all in all we're done, other than waiting for the carpet. So I have to tell you about this amazing find from last Spring. It's the bowl to what I assume was a "bowl and pitcher" set. I found it for just a few dollars because it has a pretty big crack running along the center half of it. But I'm promising to be extra careful with it. I thought I had a photo of the mark, but I didn't and now it's too late to turn it over and shoot it. It's Doulton Pomegranate Burslem. I did a little research and Burslem is the name of one of the towns in the Staffordshire Pottery region of England. I couldn't date it exactly because I couldn't find an accurate image of the exact markings. It's similar to this one but says Doulton Pomegranate Burslem on the banner instead of what's pictured. It has the letter A and then 1717, which dates it to the 1880's or 1890's. I fell in love with the Autumnal colors and designs. 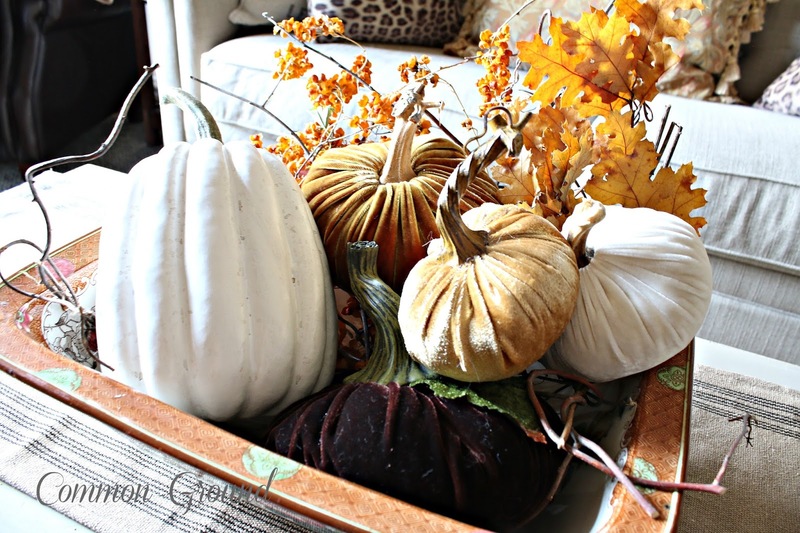 I had packed all my velvet pumpkins in my wicker trunk that we're using in the entry, so I just scooped them up with some bittersweet to fill this wonderful bowl for a fresh Fall look for the Living Room. 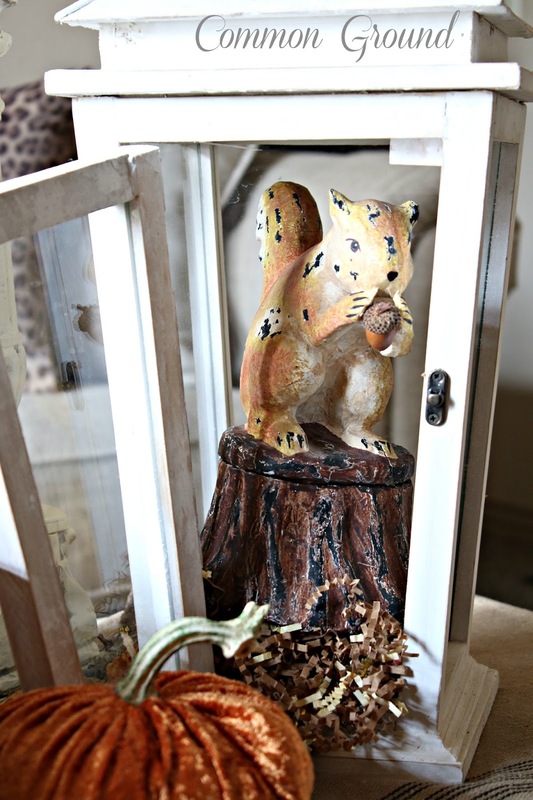 My paper mache squirrel is still in the Pottery Barn lantern. ...chewing on an acorn from a couple of years ago. I heard horror stories of nasty little creatures in the acorns, but thankfully I didn't have that problem. with a vintage muffin tin and some tea light candles. I've been bummed because I couldn't decorate much for Fall, which is my favorite time of the year. I've had to get my inspiration and Fall Fix from you all and Pinterest. So, thanks for being there for me! Dining Room, Kitchen, and Family Room furniture will be heading to the house; wow, I've missed those pieces! Hopefully from now on my posts will be coming from the new place. YAY! 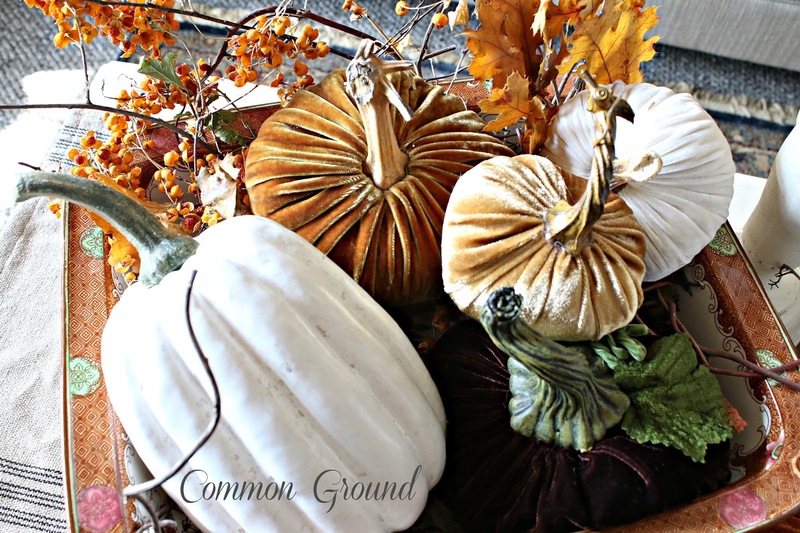 Love love love your fall display. I can't wait for you to be in the new house! So happy for you. 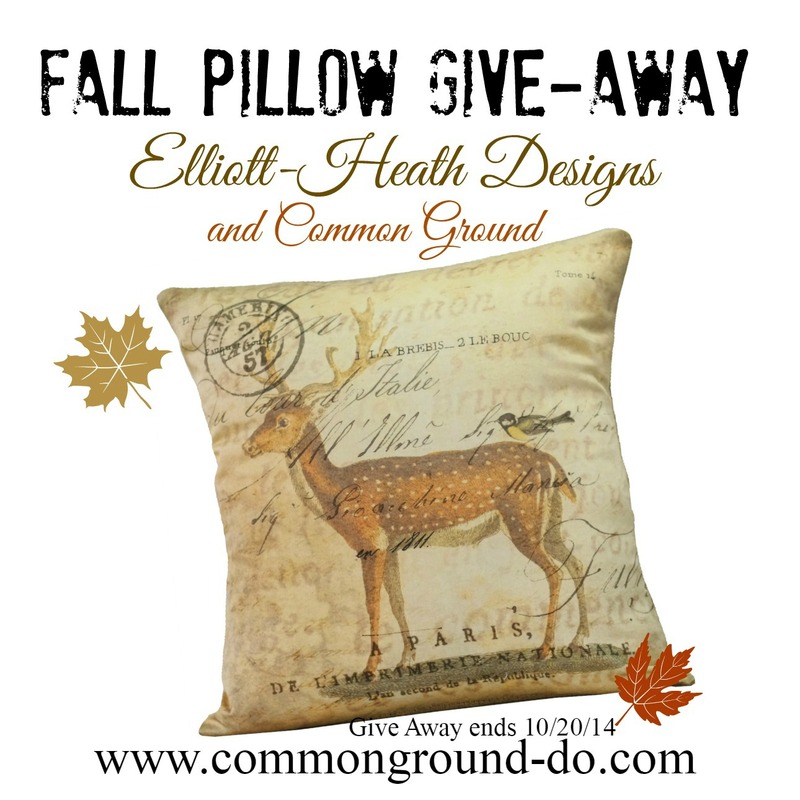 I got a pillow just last week from Heather and will be showing it off soon. Her pillows are the best! I just love your squirrel. He is such a cutie. The new bowl is gorgeous. Beautiful pictures Debra! I love this time of year. I have been so busy that I haven't been able to stop by my favorite blogs like I use to. It was wonderful to see your blog this morning. Hey Sue, great to see you stop by, I know you must be busy out there! Happy Fall! I've never seen a bowl like that. How unusual. I know you're chomping at the bit to get into your house and start the decorating. I can't wait to see it either! You have created a perfect little area, Debra- looks excellent. Looks so pretty, Debra. Love the bowl and the lantern! The bowl is quite beautiful, and looks lovely with all your pumpkins. 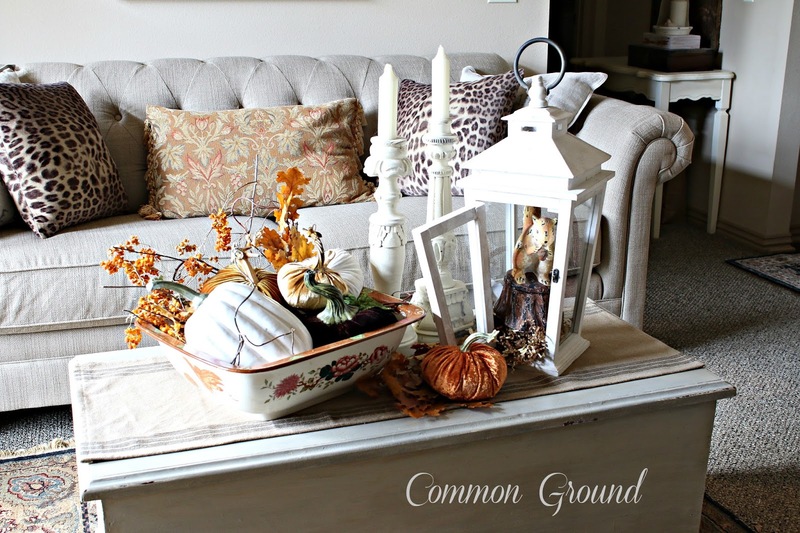 You still have time to decorate for fall, I'm still working on mine! But then I'm always behind. A very lovely vignette Debra! Oh so pretty, I love this vignette. 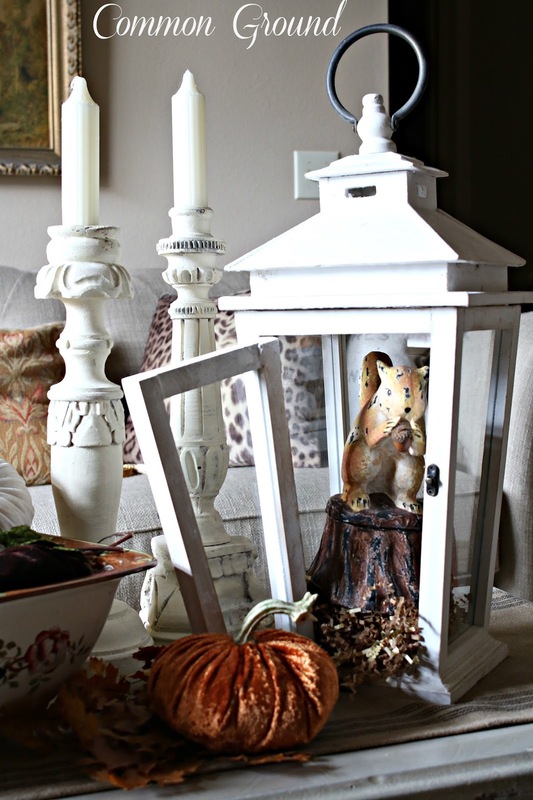 I'm loving the mischievous squirrel in your lantern, Debra. Make sure to hide the candy corn! I hope you're carpet is installed soon, so you can start calling your new place home. I'm glad you had help with all the painting you've done. That's hard work! I can't wait to see the finished rooms! 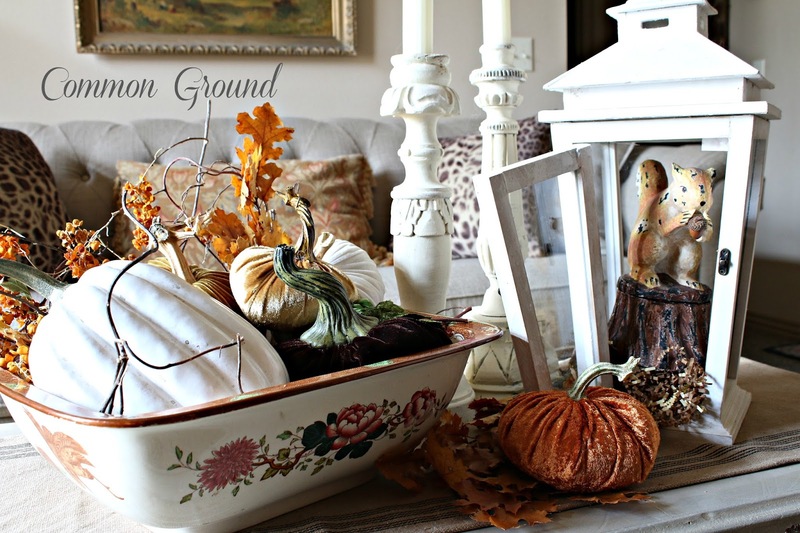 The bowl is just beautiful along with your pumpkin arrangement...nothing wrong with a little crack, it just gives it character and must of had a lot of love in its past. The vignette is so pretty and I love the bowl. What a great find. Good luck on your move. I know you are so excited to get into your new home. Looking forward to your posts. This arrangement is simple and yet makes a beautiful statement. 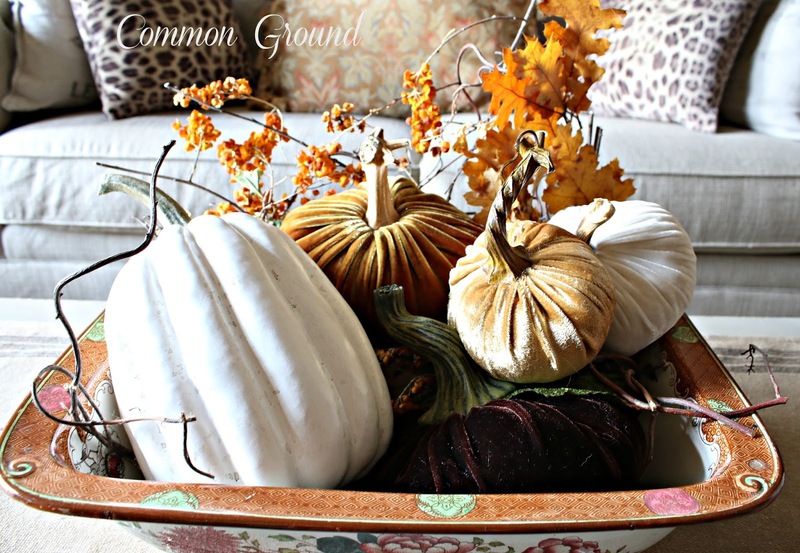 I too love the bowl and find it a perfect way to display the pretty velvet pumpkins. And, love the little squirrel. Oh Debra! Those darling cupcake candles and the sweet velvet pumpkins just stole my heart away! I love it all! 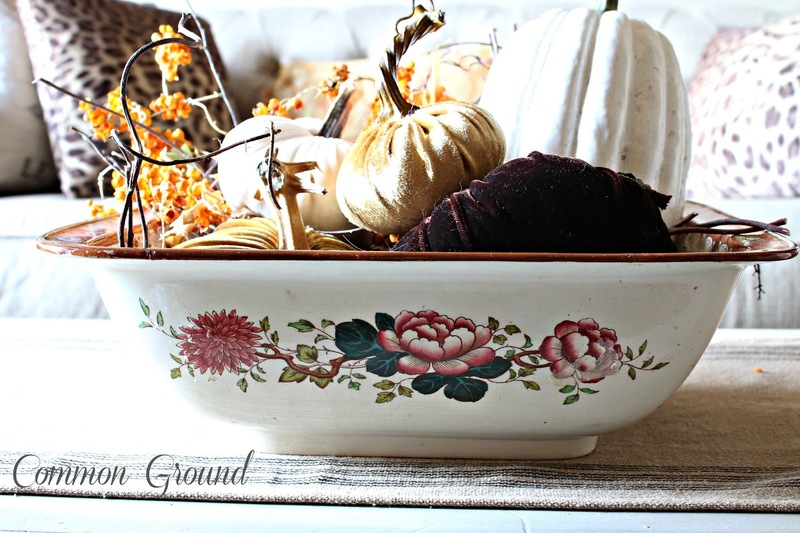 Gorgeous bowl and love how the pattern flows to the inside of the bowl too....a beautiful fall vignette! I am in love with that bowl. Gorgeous images. Very warm and cozy. 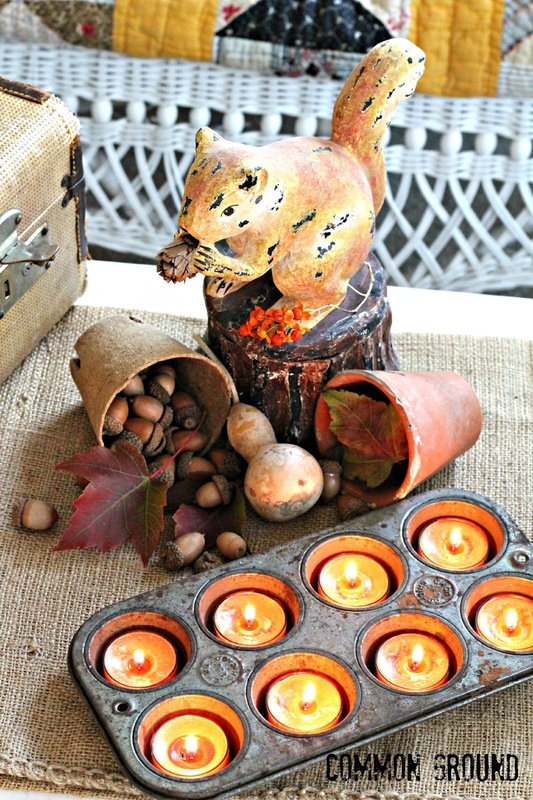 Love all your fall touches especially Mr. Squirrel he is too cute. 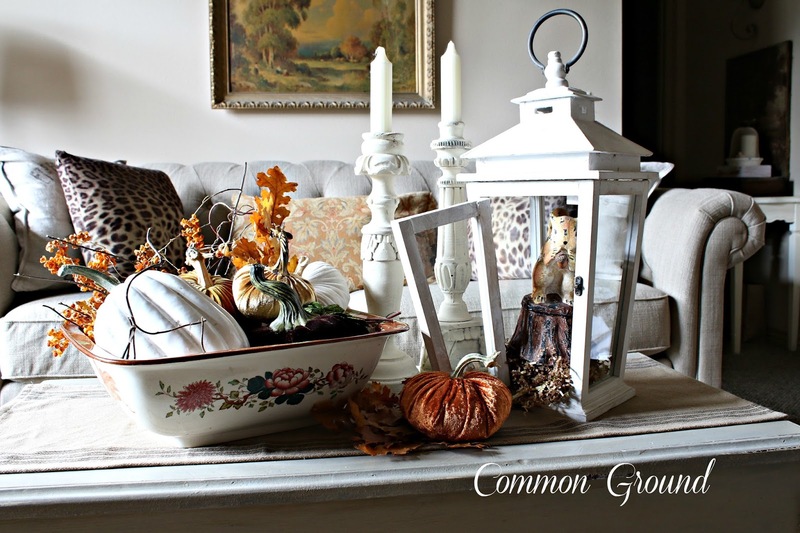 Love the fall vignette with your velvet pumpkins. So pretty. 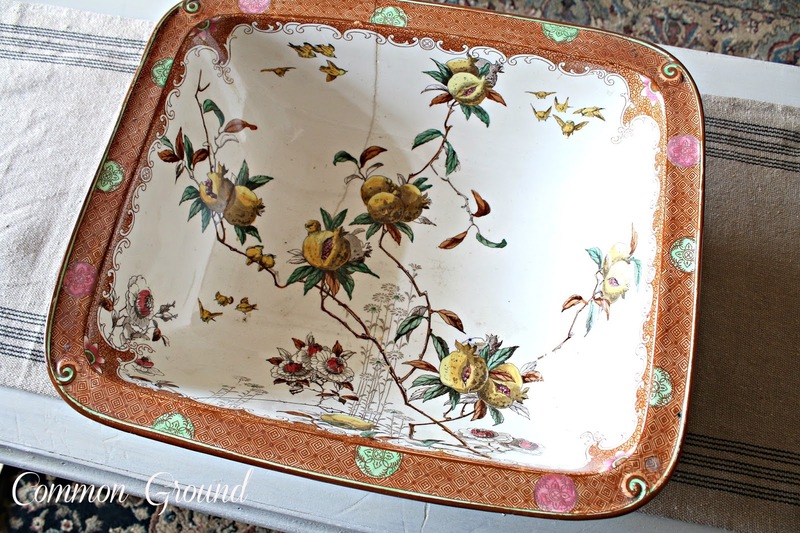 Your vintage bowl is gorgeous, dear friend!!! 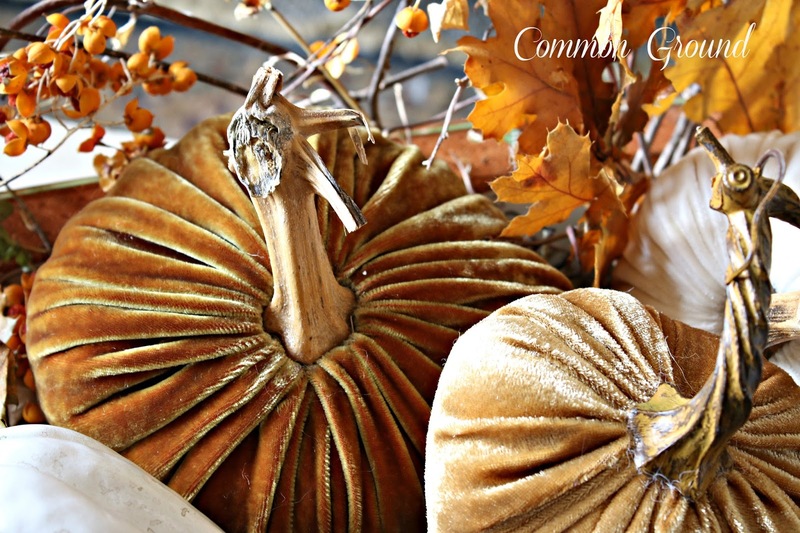 The velvet pumpkins add such a regal, elegant touch in your vignette!!! 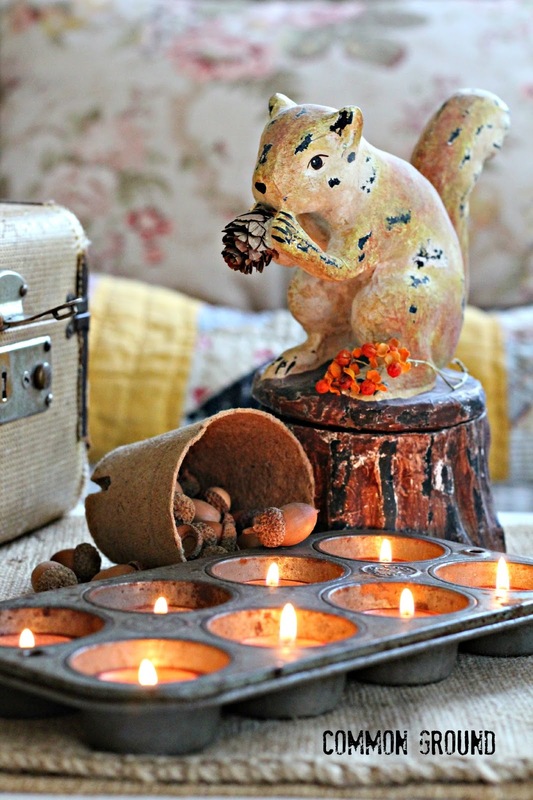 "Mr. Ed" has a collection of (faux) squirrels! Wishing you a rewarding move to your new home. Debra, that bowl is gorgeous! Love it filled with your velvet pumpkins. I remember your cute squirrel. Loved it from day one! Best of luck with your move. I am so excited for you!! Thanks for sharing with SYC. just goes to show, never get rid of anything! I have a squirrel that I put in the Goodwill box and now I just went and pulled it out. Why didn't I think of putting it in a lantern or with the pumpkins? Love your look! This is beautiful Debra! 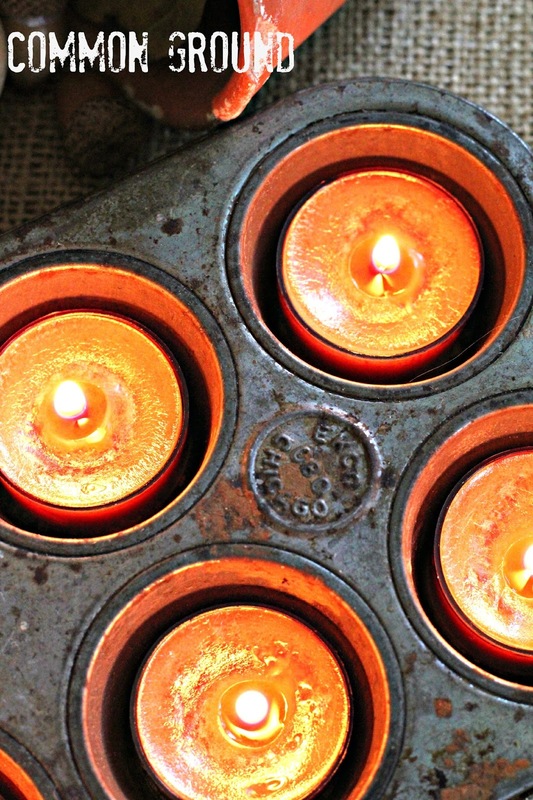 I love the muffin tin filled with candles. I can't wait to see what gorgeous things you style in your new house for Christmas!